Steve Politi tracked down the Thacker family of 1112 Stanley Road, a house flush in the middle of Gate 6-A and the only one that all Augusta's money can't buy. Over the past 20 years, Augusta National Golf Club in Georgia has bought up much of the land that borders its private grounds. 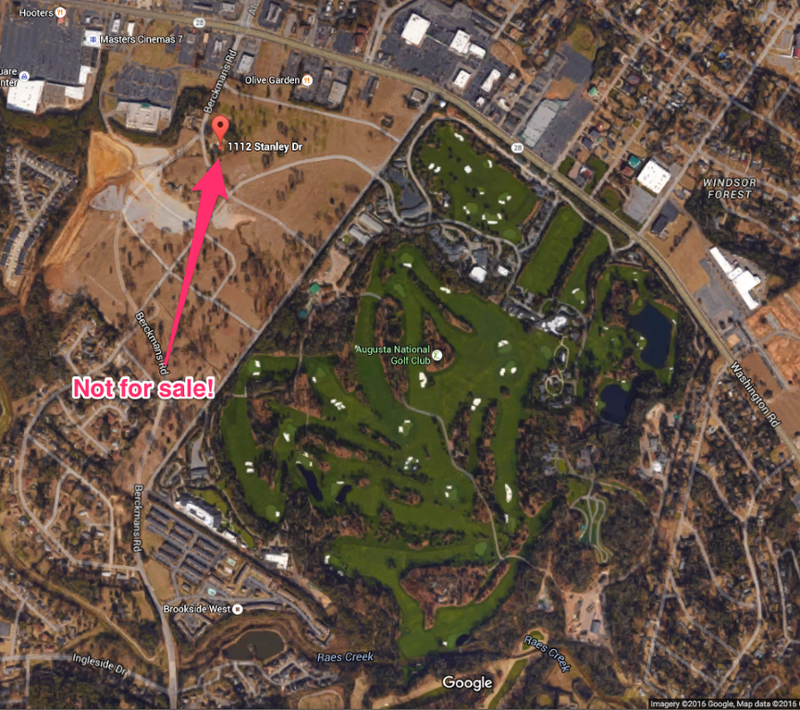 According to the Wall Street Journal, Augusta National has purchased over 100 properties covering 270 acres since 1999. Those additions have nearly doubled the size of the course and made many property owners instant millionaires. Off the northwest corner of the club sits a free parking lot, Gate 6-A, a stretch of empty land that was once a fully lived-in neighborhood. The club spent $40 million to buy and bulldoze the homes, offering the residents prices that were just too enticing to turn down. One family, however, refuses to sell - even as the offering price increases. 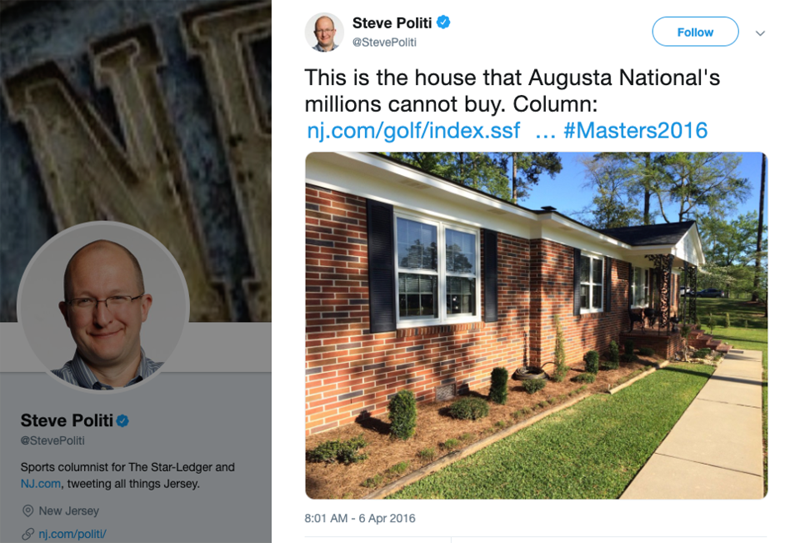 For a story on NJ.com, Steve Politi tracked down the Thacker family of 1112 Stanley Drive, a house flush in the middle of Gate 6-A and the only one that all Augusta National's money can't buy. Despite regular million-dollar offers from club officials, Herman and Elizabeth Thacker don't want to leave their home. "We really don't want to go," Elizabeth Thacker told NJ.com. "Money ain't everything," her husband, Herman, added. The house is about 1,900 square feet, has three bedrooms, and sits on about two-thirds of an acre. It has an estimated value of $261,000, according to the real-estate database Zillow. The couple built the house in 1959 and watched as their neighborhood, once green with plenty of space for backyards and swing sets, vanished. Once a year, when the Masters rolls around, the area fills up with cars. They don't mind the crowd, Politi reports. Sometimes a fan will stop by and greet the couple on their porch, complimenting their landscaping or asking for gardening tips. 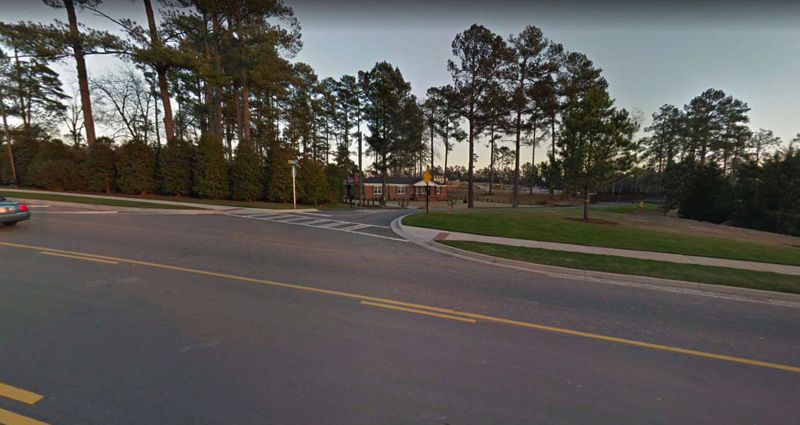 Here is a view of the house from Google Streetview, with Augusta National in the background. The location has its perks. Perhaps unsurprisingly, one of their grandchildren became fond of golf and is now a professional. Scott Brown, 35, is a PGA Tour member, but he has yet to qualify for the Masters. The couple knows that the house won't be there forever. Even Herman's brother sold his home, one of the nicest in the town, and two other properties for a cool $3.6 million. The Thackers owned another property right across the street, but they sold it to the golf club for $1.2 million. But 1112 Stanley Drive, the home in which they raised their two children, five grandchildren, and five great-grandchildren, won't be bulldozed anytime soon. That isn't stopping an official from the club from popping by the house every so often, however. "He'll come by here every so often, and he'll say, 'Just want to let you know we're still interested in your property,'" Herman said. "And we'll tell him the same thing again."